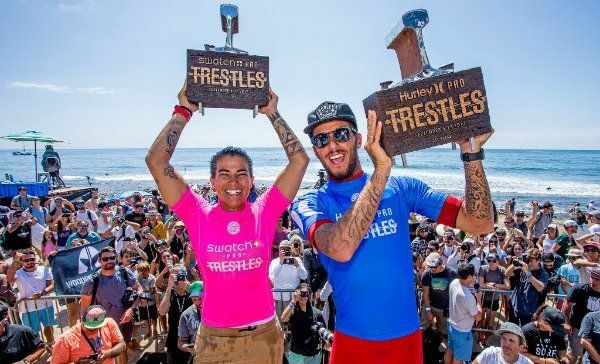 – BRAZILIANS DOMINATE FINALS DAY AT TRESTLES. TOLEDO JUMPS UP 2 SPOTS TO #7 & NOW IS WITHIN THE TITLE HUNT. LIMA JUMPS 2 SPOTS TO #13. – JORDY SMITH RETAINS JEEP LEADER JERSEY HEADING INTO FRANCE WITH JUST 3 MORE EVENTS TO GO! Brazil’s Silvana Lima and Filipe Toledo have won the Swatch Pro and Hurley Pro at Trestles. Event complete – Congratulations Filipe Toledo and Silvana Lima! SAN CLEMENTE, California/USA (Friday, September 15, 2017) – Filipe Toledo (BRA) andSilvana Lima (BRA) have claimed victory today at the Hurley Pro and Swatch Pro at Trestles in three-to-four foot waves at the famed cobblestone break of Lower Trestles. Toledo put on spectacular performances for the San Clemente crowd with his powerful turns and big airs throughout the event. Today’s Final Series witnessed Toledo continue to turn up the heat en route to the 5th CT victory of his career. Prior to taking down Smith in the heated Final match-up, Toledo knocked out 2016 WSL Champion John John Florence (HAW) in the Semifinals and Kanoa Igarashi (USA) in the Quarterfinals. Filipe Toledo (BRA) won the Hurley Pro at Trestles today after a heated Final against Jordy Smith (ZAF). The Swatch Pro Final saw a dominant performance from Lima, who claimed a massive win over Andrew by putting her in a combination situation with nearly half the heat remaining. Lima’s showcased her formidable forehand throughout the week and earned two more excellent scores in the Final, an 8.67 and 8.93. Andrew did her best to fight back, but couldn’t find a score greater than a 6.00 to give herself an opportunity to strike back in the final minutes — crowning Lima the 2017 Swatch Pro victor. CT veteran Silvana Lima (BRA) found her rhythm at the 2017 Swatch Pro to earn her first CT win since 2010. Lima now moves from No. 15 to No. 13 on the Jeep Leaderboard with her first CT victory since 2010. The CT veteran requalified for the elite tour this year after falling off in 2016 and has found much success on the WSL Qualifying Series (QS). The 32-year-old has struggled to advance out of the early CT rounds in 2017, despite her success on the QS. Now with her fourth CT victory, the Brazilian has reestablished her rhythm CT level. Andrew’s runner-up finish marks her best CT result so far of her young career after incredible performances throughout the week. The Sunshine Coast, Australia, native’s first CT Final may not have gone as planned, but her run to make it there was nothing short of brilliant after eliminating World Title contender Courtney Conlogue (USA) in the Semifinals to earn one of the event’s biggest upsets. The 22-year-old’s jaw-dropping Quarterfinal heat over Sage Erickson (USA) helped pave the way for her result that sees her amass 8,000 points. The 2016 Rookie of the Year now moves to No. 11 on the Jeep Leaderboard — just one spot from the re-qualification cutoff. Semifinal 1 saw eventual winner Lima dispatch Californian Lakey Peterson (USA). Peterson, who earned the highest heat total of the event yesterday, was not able to find the same 9-point rides and exits with a 3rd place finish, her best since the Rip Curl Pro Bells Beach earlier this year. Peterson now moves from 10th to 8th on the Jeep Leaderboard. A massive upset unfolded in Semifinal 2 as Andrew took down an in-form Conlogue on her final wave, where she garnered an excellent 8.10 (needing a 7.84). Conlogue did not better her situation on the previous wave ridden to force the issue on Andrew. Conlogue now leaves Lowers with an equal 3rd place finish. The women now head to Cascais, Portugal where Sally Fitzgibbons (AUS) will sport the Jeep Leader Jersey. Conlogue moves to second going into the Cascais Women’s Pro, where she will look for a third-consecutive event win. Now No. 3 Tyler Wright (AUS) is only 400 points behind Fitzgibbons to further heat up the 2017 World Title race. The next event on the 2017 WSL Championship Tour will be the Cascais Women’s Pro, which will see the world’s best female surfers head to Portugal from September 27 to October 5, 2017. Highlights from the Swatch Pro and Hurley Pro at Trestles are available at WorldSurfLeague.com.